Instantly removes impurities and makeup + Revitalizes skin. Normal skin has specific cleansing needs. To look and feel its best, it needs the right clean and specific care. 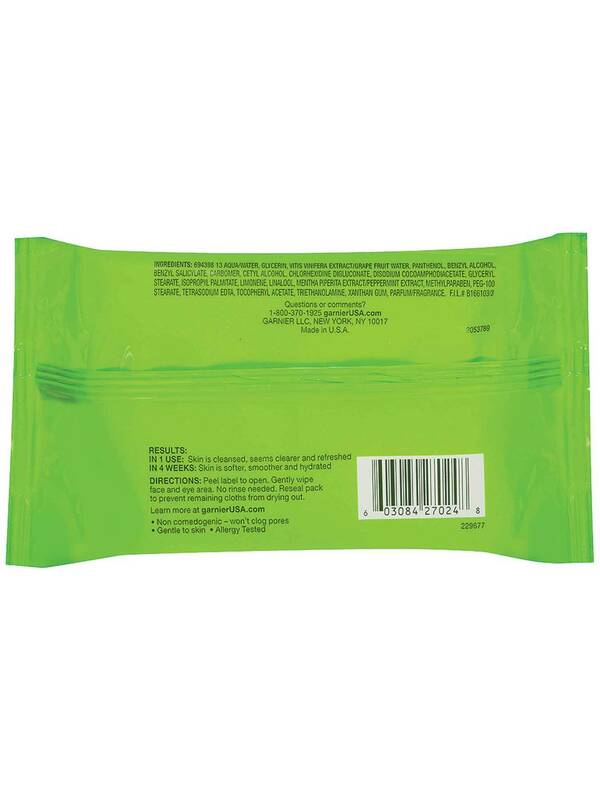 Our soft towelettes effectively removes impurities and makeup in one convenient step. The formula infused with grape water extract instantly revitalizes skin for a health look. Peel label to open. Gently wipe face and eye area. No rinse needed. Reseal pack to prevent remaining cloths from drying out. Aqua/Water, Glycerin, Vitis Vinifera/Grape Fruit Extract, Panthenol, Tocopheryl Acetate, Mentha Piperita/Peppermint Leaf Extract, Triethanolamine, Carbomer, Cetyl Alcohol, Disodium Cocoamphodiacetate, Glyceryl Stearate, Peg-100 Stearate, Xanthan Gum, Sodium Chloride, Tetrasodium EDTA, Isopropyl Palmitate, Myristyl Alcohol, Stearyl Alcohol, Chlorhexidine Digluconate, Methylparaben, Parfum/Fragrance, Benzyl Saylsalicylate, Limonene, Linalool. Rated 1 out of 5 by MRobinB from Changed formula? I'm not sure if the formula has been changed, but I have been using these remover towelettes for quite a long time and loved it, but the package I just bought is different. The smell is completely different and not in a good way. The texture is not the same either. The old formula had a refreshing smell to it. I am not liking this product at all compared to the old formula! Rated 5 out of 5 by sochoa from LOVE These towelettes are the only ones that don't irritate my face or contribute to my breakouts (which is a crazy combination/dry/sensitive/acne-prone mess). These inspired me to start using the SkinActive Clean+ Invigorating Daily Face Scrub since I loved this product so much. They leave my face feeling clean, my pores feeling open, and no leftover makeup residue. Rated 4 out of 5 by 2urhealth from Quick & Easy Facial Cleansing Being a busy mom on the go, I needed something that I could easily pop into my bag and take with me. I've tried lots of different products, but was really impressed with #Garnier and their #OilFree Cleansing Towelettes! Best part was I didn't feel all greasy nor did I have burning in my eyes like other products leave you feeling. They were great for just feeling clean after a hike or being out and about with the kids. Even better is how easy it has been to take off makeup on the go; especially eye make up! Spectacular!!! Would love to give a 5 star, but for me I also look for a product that is as natural and chemical free as possible. This one was impressive though. Rated 4 out of 5 by mackqc from MUST TRY!!! This is a good product. After one week of using one wipe every morning, my face was well moisturized and I used no lotion or cremes in addition to these wipes. I have sensitive skin and after using the wipes for one week, I didn't have any blemishes or allergic reaction. My skin felt refreshed and clean. I used the wipes to remove my make up and it works as a great make up remover as well! The fragrance is light and heavenly, unlike those chemically smelling wipes. I dislike the packaging because the wipes can dry quickly if not seal properly. These wipes are terrific but I wish the they were a little bigger in size. I really like these wipes. Rated 5 out of 5 by beyonexpatations from Fresh Clean Feeling I generally don't use face wipes during the day, but because I have been working out in the heat more and I do wear makeup, at the end of the day it's nice to have these wipes to clean my face off with before I go home and take a shower. They smell good, and they are convenient to carry around in my purse! Rated 5 out of 5 by Trommers3 from Garnier Skin Active I really enjoyed this product. I was so excited to try it!! It was very easy to clean off all of my makeup. I was actually very shocked at how well it worked the first time I used it. It smells very fresh and clean. I love how clean my face feels when I use them. I have nothing bad to say about this product.